A social settlement formed by Jane Adams & Ellen Gates. The Hull House Kilns were an outgrowth of the Labor Museum organized in 1927. 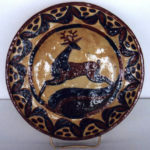 The kilns made all sorts of tableware pieces, animal & children figures of dense heavy clays glazed with very bright colors. 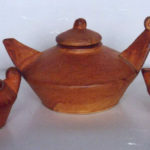 Some had decorated or hand incised designs. Founded in Chicago, Hull House was the creation of Jane Adams and her friend Ellen Gates Stark, college friends. After meeting at college some years passed before the two were reacquainted, but they did meet again and spent time traveling in Europe. The women were particularly impressed with various artistic movements they witnessed during their travels, especially in England where they visited Tawby Hall. 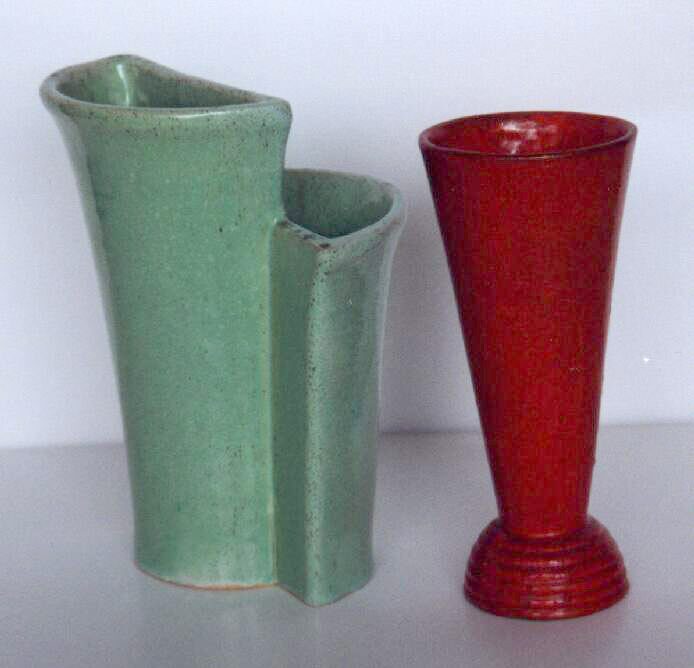 In 1889 Jane and Ellen moved to an apartment in Chicago and began shopping around the idea of starting a pottery. Eventually they purchased a house and over time filled it with the art they collected as they traveled. This was the beginning of Hull House; they used the house as a sort of museum and enjoyed explaining to visitors about the various pieces they had collected. Over time the house increased in its educational value, as music, English and citizenship classes and lectures were presented there. On any given day one might find dance instructions or language classes being taught at Hull House after school. The rooms were frequently filled with boys and girls from various clubs around Chicago. A strong female presence was felt there and Hull House became known for its good female role models. Hull House served and educated children, and Jane Adams and Ellen Stark became advocates for child labor laws that were passed in Illinois. In addition to the children that regularly visited, the house attracted persons of all ages and was considered a museum, not a school. In the 1890’s Ellen Stark returned to Britain and learned the book binding business. She then took this knowledge back to Hull House where a bindery was started. January 1927 saw the start of Hull House Kilns. 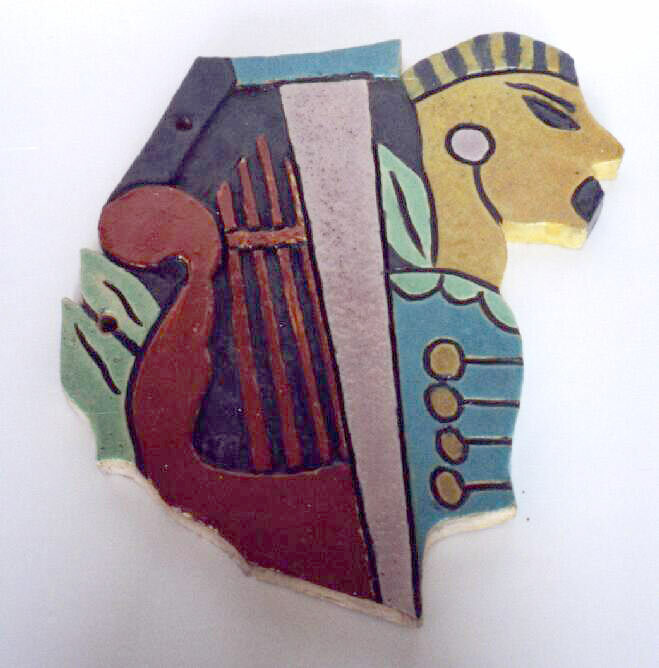 Myrtle M. French, a ceramics instructor at the Arts Institute of Chicago, taught ceramics classes at Hull House. 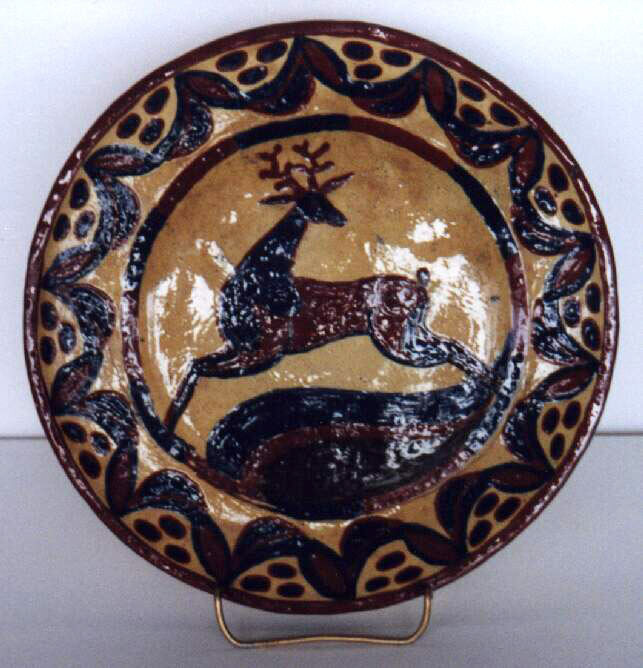 The clay used for this pottery was a blend of red Illinois clay and the more buff-colored clay of Minnesota. Pieces were fired in small kilns. 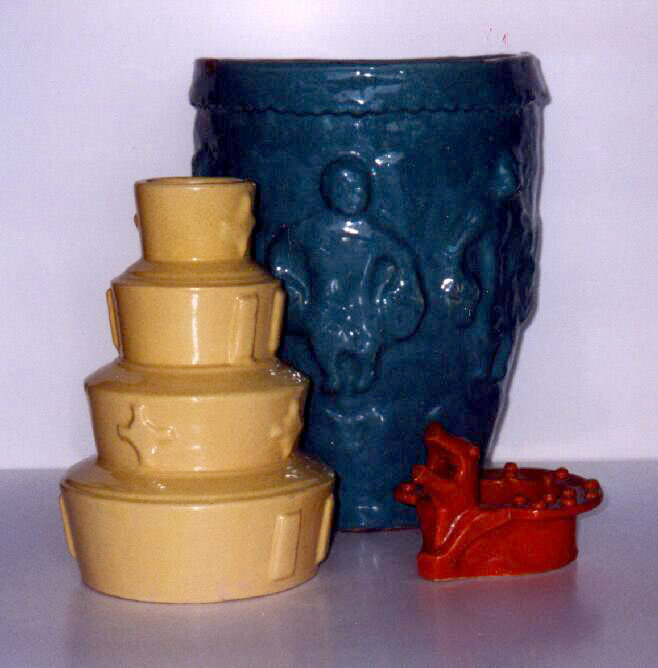 Hull House Kilns became know for its bright-colored glazes. 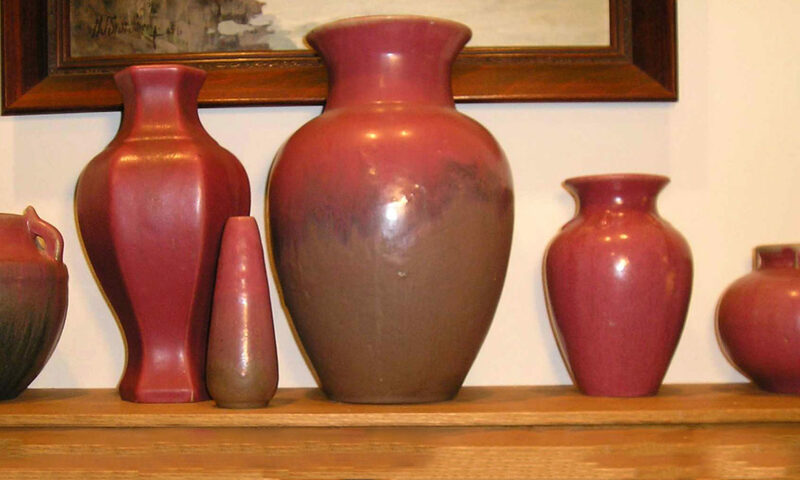 The early pottery was strongly influenced by Mexican immigrants, however, many of them returned to Mexico during the Great Depression as there was no work. In 1931 the theatre at Hull House was remodeled and large ceramic wall-mounted masks of various sorts were made especially for this occasion. In addition to pottery, metal working classes were taught at Hull House; the pieces were sold in the Hull House shop. The Hull House Kilns operated until the depression. Jane Adams died in 1935. Charlotte Carr became the head resident in 1938 and the Hull House shop operated until approximately 1940, although with somewhat of a shift in emphasis. In 1961 “urban renewal” brought about the destruction of 13 of the Hull House buildings, situated on land that the University of Chicago found desirable for other uses. However, the university was persuaded to save two buildings; they constructed new structures around them. 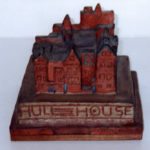 An octagonal sign is often seen on Hull House pieces. It is also fairly common to see metal tags. “Hull House Chicago” is often indicated. You may also see the mark “HHK” for Hull House Kilns. The metal works are not marked. Steve noted that there was an abundance of bowls, cups and saucers made and that turquoise and orange were commonly used colors.